With WCRC 37669 (masquerading as 37565!) and 37668 double-heading the train, the BLS "565 Special" approaches Crewe Platform 12 at 07:27¼ on the morning of Saturday 2nd September 2017 in sunshine that lasted most of the day. The train departed from Carnforth at 05:38, three minutes late, but was three munites early arriving here. 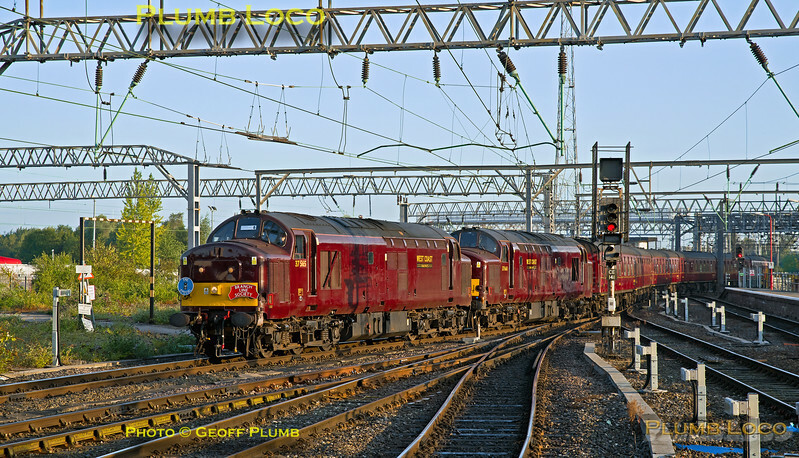 The WCRC locos came off the train at Crewe and were replaced by Colas 37254 and 37175 on the north end of the train to depart at 08:08 for Chester and eventually Carmarthen. Digtal Image No. GMPK3654.